The Sampler was released as a publishers' demo record - a run of less than 100 copies - designed to get other artists to cover Cousins' and Hooper's songs. Its importance for Strawbs fans is that it includes all the tracks culled from the first version of the group's first album, as well as a few other demos and early versions. It was produced between the first Strawbs album and Dragonfly. I've been asked this many times. The Strawberry Sampler No 1 came as news to me back in 1992. I knew there were some outtakes from the Strawbs album which were not used - that much was set out in Jerry Gilbert's article on Strawbs in ZigZag 52 and 53. I saw an ad in Record Collector for something called "Strawberry Sampler No 1" which mentioned Sandy Denny. I contacted the guy (by post - that's how we did this sort of thing pre-internet!) who was selling it, asking for more detail and an idea of how much he wanted for it. He gave me a call and explained what was on it, from which I deduced that it was the missing tracks for Strawbs). But it was too expensive so I said I couldn't afford it - was there any chance of a listening copy ? He obligingly sent a tape (with the equally difficult to find Heartbreak Hill) on the back). I sent him a long letter with my thoughts (which is reproduced below - with hindsight not entirely correct, but not a bad stab). It turned out that that copy of the Sampler had been bought by a trader in the South West who had a good relationship with RC, and used to send album sleeves up for them to photograph. That's what had happened here, with my letter still inside the sleeve. As well as editing the article, I pointed out to RC that this was a "great lost album"which they loved to write about, and I ended up co-writing a 2-pager with a member of RC staff all about the Sampler, which came out in the same issue as the Strawbs article, Issue 177 in 1994. After all that I got in touch with the trader and proposed a swap: I had a rare vinyl album by Spriguns of Tolgus ("Jack With A Feather", their incredibly rare 1974 private pressing), which I'd picked up for �2 GBP on a Cambridge market stall (Andy's Records if anyone recalls). By then it was worth (to others maybe) considerably more than the Sampler, but had just come out on CD anyway and the Sampler was worth far more to me ..
Foggy (Danny Clarke (these days known as Granville Clarke and a successful watercolour artist) and Lenny Wesley) - they covered four songs off the bloody thing on their "Born To Take The Highway"album so they must have had it! ("Till The Sun Shines Through"[aka "Till The Sun Comes Shining Through"], "Josephine For Better Or For Worse", "Sail Away"[aka "Sail Away to the Sea"], "Who Knows Where The Time Goes". Note from WML CD release: "In 1969 just 99 copies of this record were pressed on 12 inch vinyl as a publishing demo. There are just two known vinyl copies in existence. The record includes previously un-released out takes from the abandoned first album Strawbs." 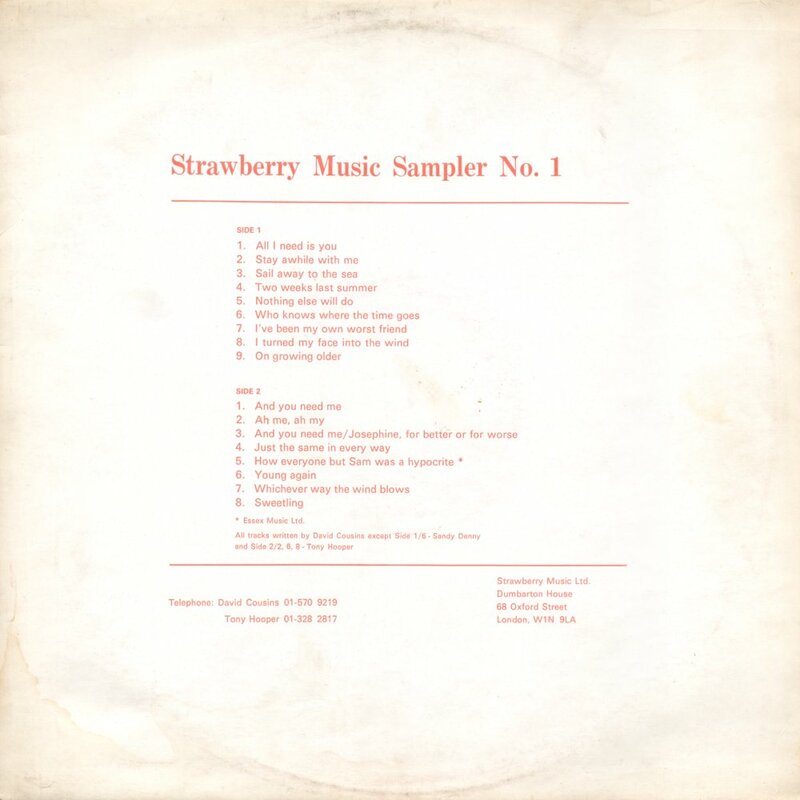 Inner sleeve note says Strawberry Music Sampler No.1 has become one of the UK's most collectable vinyl records. In Record Collector: Rare Record Price Guide 2002 the record is valued at �500.